Sunny Boy 7.0-US. 208/240VAC emergency power outlet Triple MPPT. With Secure Power Supply (SPS). Please visit our store to see what else we sell! Product Overview The all new Sunny Boy Residential String Inverter – Three MPPT Circuits, allowing one string to each, flexible string sizing. Secure power supply 2000W. Integrated DC Disconnect Integrated WiFi or Wired datalogger and output to Sunny Portal. The Sunny Boy-US series features a wealth of improvements and joins SMAs lineup of field-proven solar technology backed by the worlds #1 service team. The worlds first Secure Power Supply now delivers up to 2,000 W of opportunity power when the grid goes down and the sun is shining. Installation has never been easier thanks to SMAs Installation Assistant, direct access via smartphone, and integrated DC disconnect. The Sunny Boys multiple independent input channels, each with SMAs OptiTrac Global Peak, mean hundreds of stringing configurations for flexible system design while solving the challenges of complex roofs and shading. Same Name, New Game. The residential PV market is changing rapidly, and we understand that your bottom line matters more than ever. Thats why weve designed a superior residential solution that will help you decrease costs throughout all stages of your business model. Refer to the spec sheet to see how the Sunny Boy-US is once again raising the bar by offering improved performance, enhanced features, and most importantly, cost savings across the entire spectrum of residential installation processes. View spec sheet here. UL 1741 and 1699B compliant. Integrated AFCI meets the requirements of NEC 2011 690.11. Secure Power Supply provides daytime power during grid outages. 97.5% maximum efficiency. Wide input voltage range. Shade management with OptiTrac Global Peak MPP tracking. Three MPP trackers provide numerous design options. Technical Specifications Max Usable DC Power: 7200W (at 240 V) Max DC Voltage: 600V Max Input Current: 10A Max AC Apparent Power: 7000 VA (at 240 V) Dimensions: 21.1 x 28.5 x 7.8 in. 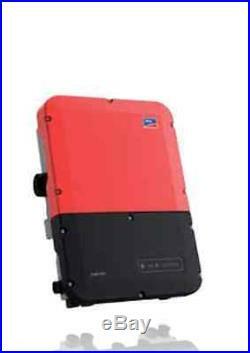 The item “SMA SB 7.0-US, 7000W Inverter, Grid-Tie, FREE SHIPPING” is in sale since Friday, January 13, 2017. This item is in the category “Home & Garden\Home Improvement\Electrical & Solar\Alternative & Solar Energy\Chargers & Inverters”. The seller is “bubskiy” and is located in Nationwide. This item can be shipped to United States.